Spoke is an automated, help desk assistant powered by artificial intelligence (AI), providing organizations with a self-service platform for ticketing and knowledge management in a tightly-integrated package. The platform gives support teams in any type of organization a single location to manage employee requests using a friendly chatbot to automatically respond to questions on Slack, web, email, and SMS. Spoke helps facilitate and streamline ticketing processes using AI to find the correct, relevant answers for employees, providing support teams with interruption-free time to work on projects and get things done. Users can file requests through Slack, SMS, email, or via the web. When asked a question, Spoke will either answer it on the spot, or route the request to the relevant department. Because Spoke is powered by artificial intelligence, it gets better at answering questions on its own through machine learning. 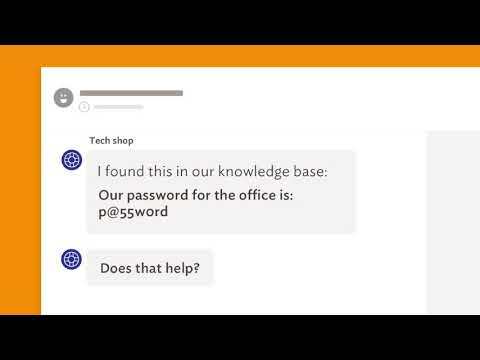 The knowledge base keeps track of all kinds of useful information automatically, and employees can add items to the knowledge base as their questions get answered. Users are able to create new teams in order to stay organized, select team names and colors, and provide specific members with permissions to create, edit, and delete the team’s resources. Incoming requests can be automatically assigned to team members, or set as private. Support team members can view all their assigned requests within the inbox, and will also be notified of new requests via email. Users can check their team’s metrics by accessing the expanded view to see average resolution times, average response times, how many requests are still open, and more. Outstanding. A very targeted software that fits a specific need perfectly. We get a intuitive tool, fully managed by the awesome Spoke team, that allows our organization to centralize domain knowledge that would otherwise be horded and silo-ed by teams and team members. It is an excellent training and teaching tool to streamline users needs for information. Spoke gives time back to our users who would be otherwise burdened with a variety of questions during ramp up and team movements.The software is an excellent approach to managing requests and knowledge. We utilize Spoke to centralize domain knowledge that would otherwise be lost during a turn over or that needs to be communicated to a variety of users. Assigning teams, building out KB articles and letting users generate content is very simple. The software is an excellent approach to managing requests and knowledge. We utilize Spoke to centralize domain knowledge that would otherwise be lost during a turn over or that needs to be communicated to a variety of users. Assigning teams, building out KB articles and letting users generate content is very simple. The only con of this software is the approach is so novel to many of our users that there has been a steep learning curve in documenting their domain knowledge using the tool. It is simple to use and operate but our users are use to silo-ed knowledge that using Spoke has been a big change for them. Overall, Spoke has saved my back many times and reduced walk-up requests. People know they can get their answers quickly if they simply "Ask Spoke! "AI all the way. We have looked for a solution to helpdesk and common questions that provided our users with better overall user experience and Spoke was the answer. Our users live heavily in Slack and thanks to Spoke's seamless integration with Slack, my users are able to ask questions and get answers before even talking to a real human. If they still prefer human interaction, they can raise a request right in the same window! AI all the way. We have looked for a solution to helpdesk and common questions that provided our users with better overall user experience and Spoke was the answer. Our users live heavily in Slack and thanks to Spoke's seamless integration with Slack, my users are able to ask questions and get answers before even talking to a real human. If they still prefer human interaction, they can raise a request right in the same window! This isn't a full-fledged helpdesk software and may not support the needs of a growing enterprise. However, Spoke is constantly evolving and open to feature requests. We wanted a service desk that is easy to use and easy to maintain. We also wanted something that could reduce time spent on menial tasks, and could track the requests we get all the time in various places in our daily schedules. Spoke works much more smoothly with Slack than other products we have tried, and we have witnessed it auto-answering tickets and prompting users for more information. After a couple of months we probably have saved... hours already, in time spent on prompting users for info and disseminating repetitive information.As an application goes, the transition has been pretty seamless. I guess that's just what happens when you make simple, easy-to-use, straightforward software? Also the Spoke team is fantastic - they're definitely one of my favorite vendors to work with, and it always feels like they take our feedback seriously. They're quick to respond to questions and easy to schedule check-ins with. The whole experience is really lovely. As an application goes, the transition has been pretty seamless. I guess that's just what happens when you make simple, easy-to-use, straightforward software? Also the Spoke team is fantastic - they're definitely one of my favorite vendors to work with, and it always feels like they take our feedback seriously. They're quick to respond to questions and easy to schedule check-ins with. The whole experience is really lovely. The software is relatively new so some features are limited. But their development cycle is very fast! So it hasn't slowed us down much. My startup needed a platform to better manage employee requests. Prior to Spoke requests came in the form of emails, text messages, verbal conversations, and even scribblings on post it notes. Not scalable. Spoke helped us centralize requests via its integration with Slack and is the right solution for a company our size. What do I like about most about Spoke? It's simple and easy to use. I love it when platforms are intuitive - 'keep in simple' and they do! Learning existing a new features are a snap, and Spoke provides excellent customer success support if I need help. What do I like about most about Spoke? It's simple and easy to use. I love it when platforms are intuitive - 'keep in simple' and they do! Learning existing a new features are a snap, and Spoke provides excellent customer success support if I need help. I'd love to see more features! Spoke recently added forms for requests which is a good start. I enjoy the software and the prompt customer service. I also love the time saved with Spoke. Suggestion: making an integration between emails and spoke. I'm not sure if that's actually possible, but sometimes employees still email the team questions that can be answered through Spoke and at the moment I have to manually enter the question, assign it to myself, and edit the requester from myself to the employee. I like that it decreases the amount of questions/emails we get since employees can find answers on the knowledge base. I also like the spoke and slack integration and the new thread feature. I like that it decreases the amount of questions/emails we get since employees can find answers on the knowledge base. I also like the spoke and slack integration and the new thread feature. I do not like, and I'm not sure if this is lack of employee training because I'm not able to see it from their end, that sometimes employees end responding to questions by creating a new request. Therefore, there are multiple "requests" which are actually responses to the original request. The thread feature has decreased this a bit. Spoke provides all types of internal support teams with a single place to manage all employee questions and requests. Eliminate frequent interruptions and spend more time focusing on projects by providing employees with a self-service tool powered by artificial intelligence (AI). Spoke offers streamlined ticketing, a flexible knowledge base, a self-service chatbot, and multi-channel support in order to provide employees with the info they need, quickly. Spoke’s friendly chatbot uses AI and machine learning to automatically respond to questions via Slack, email, web, and SMS. The more it's used, the smarter and more helpful it becomes. Spoke’s knowledge base keeps track of all types of useful information automatically and enables users to add new items to the knowledge base as questions gets answered. Below are some frequently asked questions for Spoke. Q. What type of pricing plans does Spoke offer? Q. Who are the typical users of Spoke? Q. What languages does Spoke support? Q. Does Spoke support mobile devices? Q. Does Spoke offer an API? No, Spoke does not have an API available. Q. What other apps does Spoke integrate with? Q. What level of support does Spoke offer?